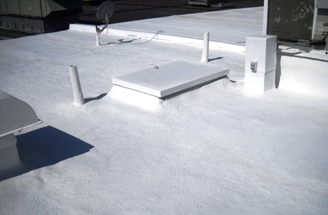 Provide replacement foam roof system over leaking and deteriorated existing roof. The gravel was removed from the existing ballasted roof and roof was prepared for foam application. Spray Polyurethane Foam was applied over the entire structure with extra care taken around mechanical systems and other roof protrusions. Silicone base coat and top coat was applied over all foam. Walkways were built to the mechanical systems and granulated. 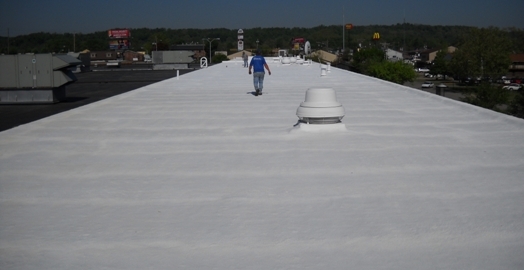 The roofing project had to be completed without disruption to the daily operation of the store. There was a large concern with potential overspray possibilities. Minimum 1" of Lapolla spray polyurethane foam over prepared surface. Neogard silicone base and top coat. Sesco granules used on walkways to provide extra texture. The customer was extremely pleased that all leaks had been stopped after project completion. 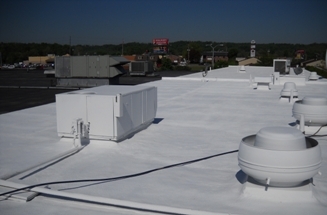 The roof was completed in a timely manner with no apparent disruption to business operations. FoamCoat utilized a spray booth to minimize the potential for overspray, and consequently, not a single overspray issue arose. The customer was extremely pleased at the appearance of the roof and excited about their potential for energy savings based on a white, reflective surface combined with the added R-value of the foam.